Thank you for your interest in the Live Your Dream program. ​Applications will be available early fall 2019 for the next award cycle. Our Annual Wine Country Holiday Home Tour and other projects fund these awards and we are so grateful for our community support of these efforts. Contributions can be made now to help with other projects, and next year's Live Your Dream awards. 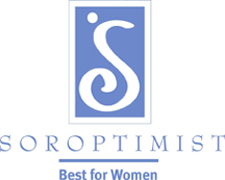 On March 7, 2017 Soroptimist International of McMinnville was honored to grant awards totaling $10,000 to five women from Yamhill County. The funds can be used to help them with school and other expenses to better their lives.